Scroll down or click on the above names to read about the dogs we've been privileged to own over the years. Jazzy (from 'Jasmine' - a reference to her colour, and also to her Chinese origins) is the latest Shar-Pei addition to our family. We wanted a very pale girl, and between Cream and Isabella we chose the latter. The possible colours from her offspring are so far proving to be very interesting! Jazzy is a very gentle, quiet girl, but absolutely full of mischief. After buying Gadget, we decided that we wanted a girl also, possibly to breed with Gadget, or possibly with another boy. Like all puppies she was full of energy when she arrived at home (she had to be of course - it was her and 2 large boys! ), although she settled down very quickly, and is now very calm and quiet (although definitely the boss!). We didn't know when we bought her that Widget had only another 3 weeks with us, but thankfully we got some wonderful photos and video of the whole family together (all 6 of us!). Once Widget got to around 13 years old, I knew that the inevitable day couldn't be far off (happily it was nearly 2 years off!). 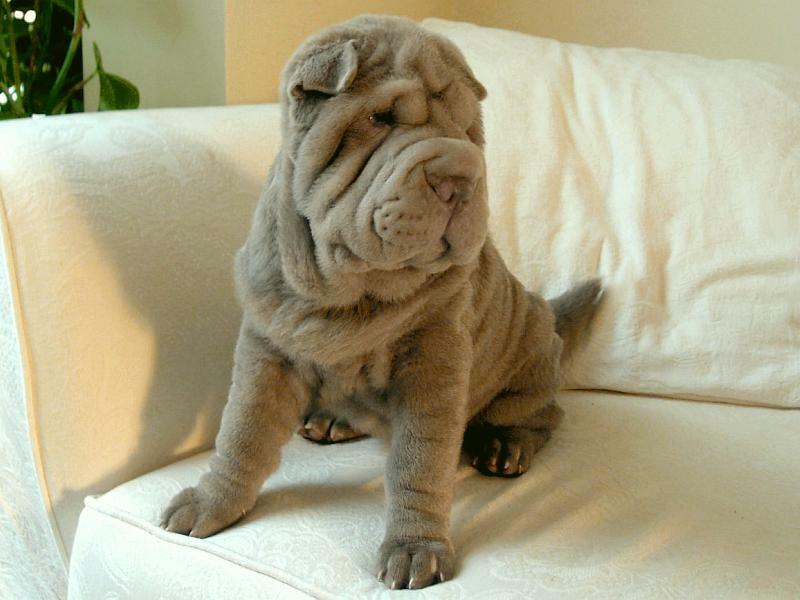 So I decided to ensure that I wouldn't be faced with a dogless home, and looked for a top quality Shar-Pei boy. Gadget - a logical choice of name after 'Widget' - was the result of my search. 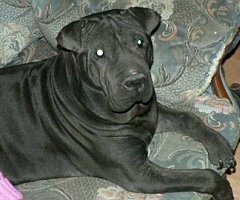 To this date he's still one of the finest-looking Shar-Peis I've ever seen, with an excellent bloodline and equally good health. 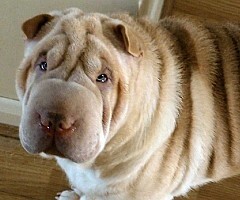 In every respect he's the ideal Shar-Pei. He's very cute too! 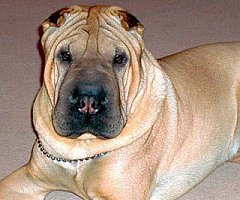 Widget was my second Shar-Pei, and - without taking anything away from my other dogs - was without doubt the most memorable. When my first dog Kezia died unexpectedly, I was devastated and inconsolable. My girlfriend at the time said I needed to replace her as quickly as possible (Kezia, not the girlfriend), although I couldn't imagine any other dog replacing my beloved girl. However, she managed to find a puppy for sale, and convinced me to buy him, so I did. His KC name was Qinoxin Harry Makes Me Smile, and he'd already been given the pet name Harry. He was a little rascal, very different to Kezia in appearance and character. I kept saying to him "Harry, you're such a little widget!". Somehow this name seemed so much more appropriate than 'Harry', and so 'Widget' became his pet name. Widget was the kindest, gentlest, best natured dog you could ever imagine. Of course he had his moments when he was younger, but he outgrew his puppy ways and became a true 'gentleman'. He fathered several litters with Callard and Bowser, and over the years went through thick and thin with me, including my divorce, and moving home several times. He almost died once, from on a lump of rawhide that got stuck in his throat. If I hadn't shoved my hand down his throat (I still have the scar where he bit down hard on my fingers) to dislodge the blockage, he would have died. By the time we got him to the vet, he was okay, but my hands were covered in blood! 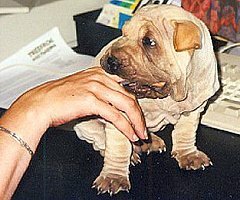 Widget lived to be just short of 15 years old - a true accomplishment for a Shar-Pei. He died peacefully of old age in his bed in his home next to those who loved him the most. He was loved very very much, and is missed even more. Edgar's arrival was a complete surprise. I'd arrived home one day, and heard a strange noise coming from upstairs. I rushed up and found Bowser on my bed, blood everywhere, and a squirming little thing next to her. I had no idea that she was pregnant, as I kept the girls separate from Widget during their seasons (unless intentionally mating them). Somehow Widget had got to Bowser, and somehow she'd been pregnant without me realising. The result was this solitary puppy, who effortlessly endeared himself to me (probably because he was the only puppy on that occasion). His pet name was derived from former FBI boss J. Edgar Hoover, because he seemed to 'hoover' up anything and everything edible! Just as Edgar was the only puppy in that litter, he was truly a one-of-a-kind boy in other respects also. 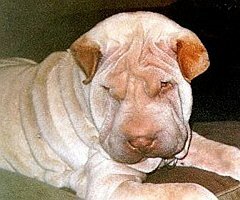 Before or since, I've never seen such a playful, comical Shar-Pei. He loved to play, with and without toys, and had endless energy in everything. Unfortunately Edgar contracted some kind of illness that, despite the vet's greatest efforts, wasn't identified, and eventually he had to be put to sleep. A short but very happy life, which I was very privileged to have him share with me. Regretting not having bred from Kezia, I (with the help of a good friend) bought 2 girls - sisters from the same litter, but chalk and cheese in every respect. One was black and the other was a pale cream, and they were both very wrinkly. Trying to think of a name for them befitting their colour contrast (but not something clichéd like 'Ebony and Ivory'), I settled on Callard and Bowser, after the English toffee company (because they looked like a pair of chewed-up toffees!). Bought at the same time as Callard, and from the same litter (we were told), Bowser was very different in appearance to her litter-mate. Heavy-set and with a real meat mouth, she was classic Shar-Pei. Unfortunately she had a few healt issues, including skin problems and bad hip joints. She was also very wayward. When Edgar (above) arrived unexpectedly, having 4 dogs proved too much for my home. I had to make the very difficult decision of selling one of them, and I chose Bowser. It was the most sensible choice, but I've regretted it every day since. 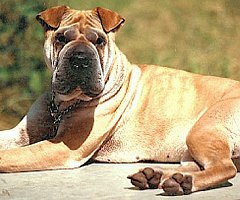 Kezia was my first Shar-Pei, and indeed my first dog since childhood, when my parents owned a Pembrokeshire Corgi. 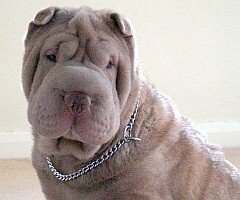 Having managed to find a Shar-Pei puppy for sale, I travelled the length of England and picked up my first little bag of wrinkles, who I named Kezia, after a character from a novel. Kezia was a gorgeous girl with a perfect temperament. Although I never showed her at a proper dog show, I one time took her to a local fair, who had organised a dog show. She didn't have any show or ringcraft training, but she walked away with the prize 'Dog the judge would most like to take home'. Sadly Kezia died unexpectedly while undergoing a routine operation on her leg, aged only 6½. © Copyright Savdeeta. All rights reserved.